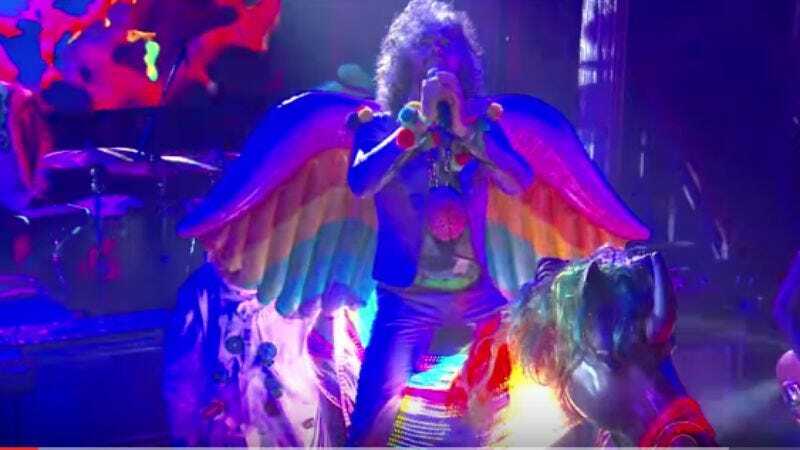 Time and money don’t seem to have tempered the fountain of weirdness that gushes from The Flaming Lips—if anything, mainstream success seems to have made the group even more determined to prove that they’re still acid-addled freaks at heart. (They probably still get flashbacks on the regular even if they’re not still taking hallucinogens, to be fair.) And the ‘Lips brought a specific sort of weirdness to their performance of “There Should Be Unicorns” on The Late Show With Stephen Colbert last night, utilizing a unicorn statue that’s been making appearances at their recent live shows along with two guys in astronaut suits, inflatable rainbow wings, and a rainbow cape that gave longtime band member Steven Drozd a sort of Noel Fielding vibe—even though the song is about unicorns and not Yeti. You can watch the ‘Lips performance below.